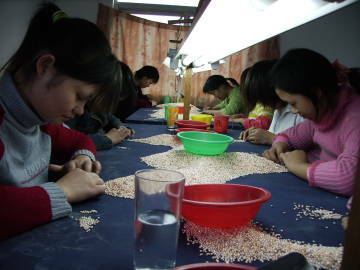 Before a pearl can be used in jewelry it usually goes through a pearl factory. 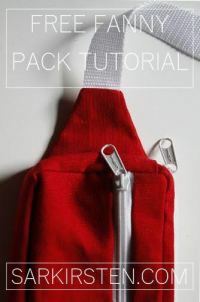 See here the steps involved in getting these lovely gems ready for use. 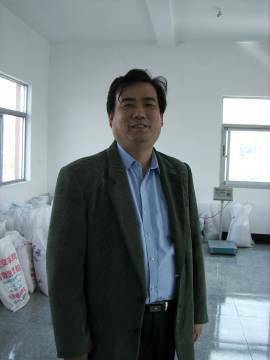 The owner of this factory was in the process of relocating to the second floor of this new building. 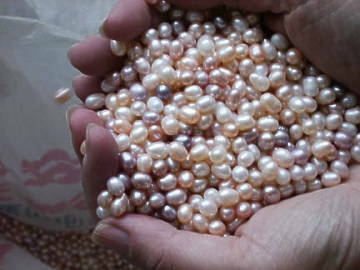 Pearls come into this pearl factory by the sack full...big sacks. They're placed in tubs getting ready for the first process. 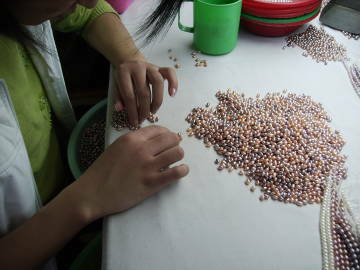 Freshwater pearls normally go through steps including a bleaching process as in the manner shown in these photos. 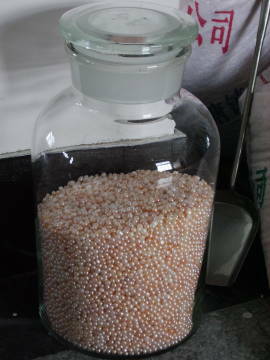 This huge sparkling clean jar looked so beautiful filled with pearls. 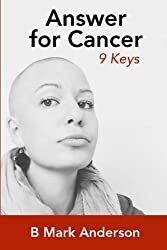 After being processed, dried, sorted by size, color, quality, and drilled with a hole they are finally strung onto strands which are grouped together with other strands either the same color or same size and quality. 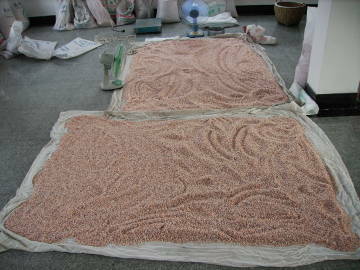 After being processed the pearls need to be dried. 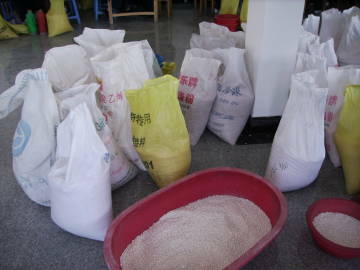 This is done by spreading them on tarps on the floor and putting electric fans on them. 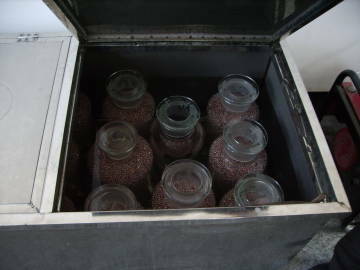 Size can be sorted with pans containing holes in the bottom, like a sieve. Shaking the pan repeatedly causes the pearls smaller than the holes to fall through. 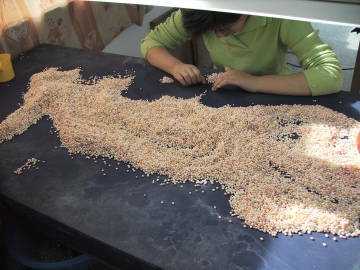 Sorting by color and quality needs to be done with human eyes, hands, and dexterous fingers. Girls at the pearl factory line tables with bright florescent lights sorting almost quicker than my eye could see. They worked diligently and remained undistracted when I took photos and scrutinized their work. It was fun to see some smiles creep on their faces when they were photographed. I noticed one girl enjoying music with headphones while she worked at the pearl factory. They dressed like any young lady would be in the west in blue jeans and colorful sweaters or shirts. The owner graciously granted us "roaming rights" to snoop in the many sacks and even take samples and photos of the pearl factory. We kept thinking this was too generous and only took a few while the workers always encouraged to take more. I think our conservative amounts surprised them. 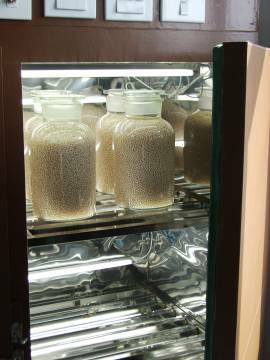 I was especially thrilled to have samples of undrilled pearls. 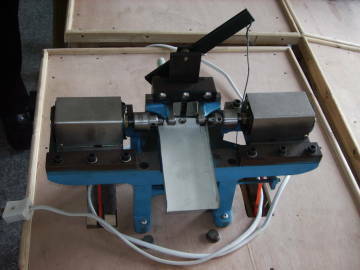 Several hole drilling machines attached to tables waited for another day when they'd be used to drill a tiny hole in each pearl. Anyone who loves pearls can greater appreciate a necklace after realizing all the steps one single pearl goes through before becoming a piece of jewelry. For very tiny pearls, and some are very, very small, no bigger than an end of a pen, it would take a keen eye to drill a hole in these or string them. These tiny size pearls are especially gorgeous when many strands are together. 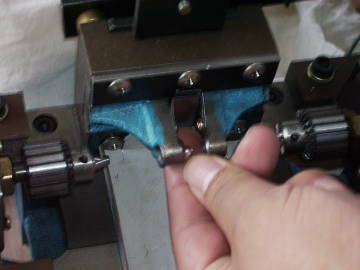 Read about historic pearl drills here. 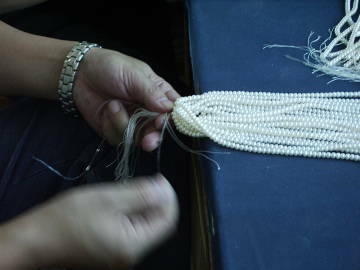 After being drilled, the pearl factory workers string them on temporary strings. 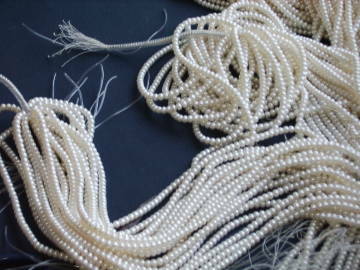 Pearls that are identical are grouped together in bundles of strands. Sometimes various colors are grouped together but they would be the same size and quality. 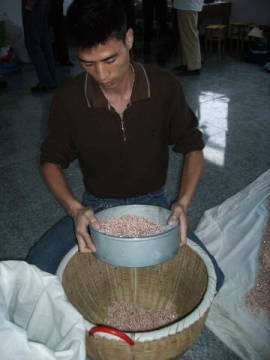 When they discovered I was interested in buying some pearls, they brought in sacks of completed strands for us to look at. 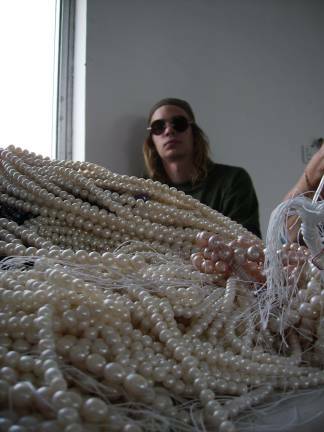 This many pearls can easily make one's head spin, but my sons, Sam and Matt helped me pick out some lovely strands. I relied heavily on their taste in pearls. I'll be adding many new styles of necklaces, earrings and bracelets to my site as we design and make them up. 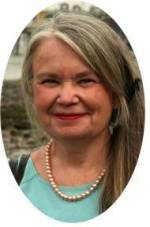 Sign up for my e-zine or RSS to keep in touch when they are added. After viewing this pearl factory, our hosts showed us a pearl farm and Asian hospitality which we soaked up and thoroughly enjoyed. Our list of "new foods tried" expanded greatly and our hosts were pleased that we "ate everything." My boys were much better at eating a hairy crab, however, than I was. 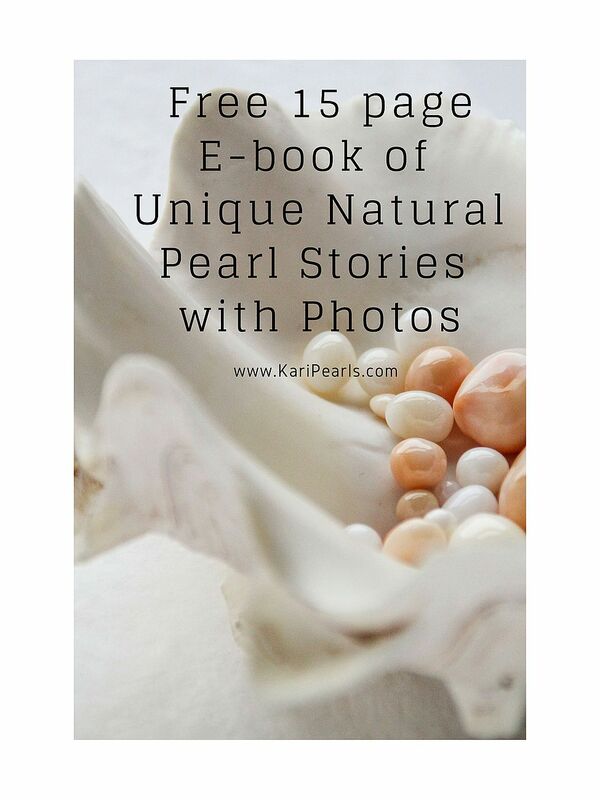 Return here to the Pearl Farm main page after reading about the Pearl Factory.